Just finished repairing this one and love the typestyle. These old Coronas are clunky but fun to type on. This is the USB Typewriter Interface board. When a key is pressed, the end of the interposer touches a copper strip attached to the circuit board. As always, your shop updates are a good read. Happy to hear business continues to be strong. And you're getting some attention these days, audio last week and video this time. Wow! I have almost the exact same machine - a Hermes 3000 with Epoca typeface. I love mine too; it is a beautiful font and so easy to read. Now let me go get it out and use it! A great variety of stories! Epoca really does look cool. 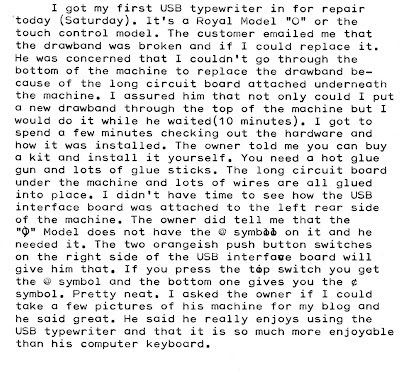 I didn't realize there was so much wiring involved in the USB Typewriter. I've been tempted to try to make one with the kit, but have mixed feelings about this hybrid technology. There are at least two different designs of the USB typewriter I think, and one has more wiring than the other does. 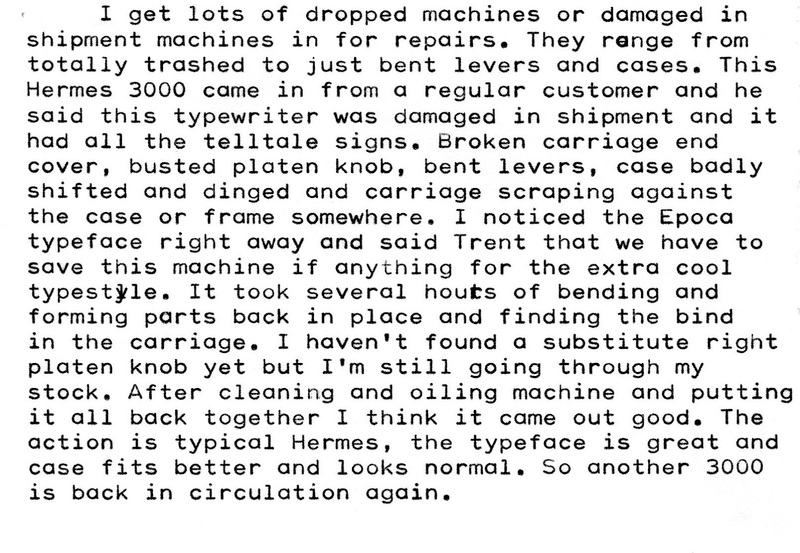 You do so much more than just repair typewriters -- you are a matchmaker, connecting people with machines that suit them. This must be a rather intuitive process. And judging from how busy your shop hours are, you have to do it quickly and efficiently. 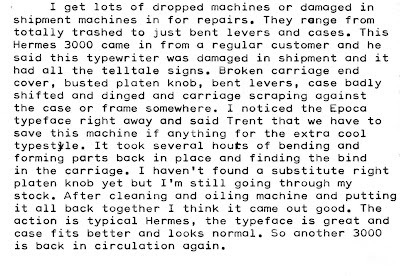 It must be a very gratifying aspect of your business, making people happy with their new typewriters! Ton- thanks for you comments. Good news, expect a package by end of week! Adwoa- Thanks. Now how about a typecast in Epoca soon! Richard- I thought all the wiring and glue was a mess too. 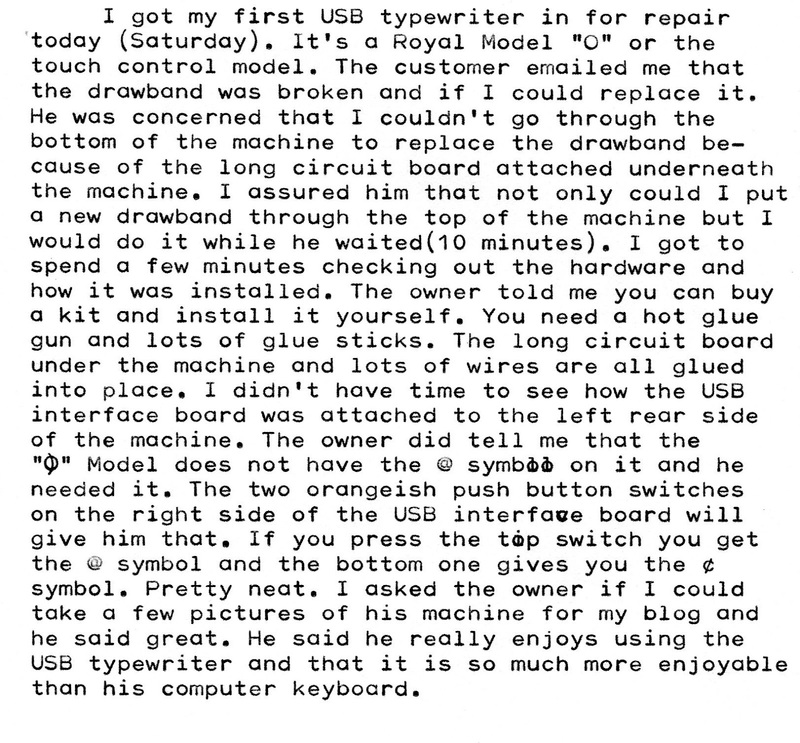 USB is not for me but I can see the attraction of it to computer people who also love typewriters. I've been told it's a very doable project. It's really just a tricked out typewriter. I always wonder where you get your supply of machines to sell from. Reading this post and the last one, you've sold quite a few lately. Do you have people buying them for you? Surely you don't have time to search estate sales, flea markets and such. I've never read in your blog about someone coming in to sell a typewriter. Clark- I get my machines from many places. 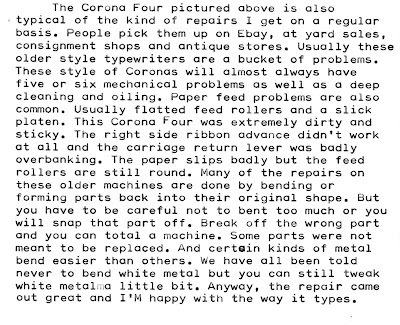 Family and friends pick up machines they see, collector friends know what I like and buy them , my friend John is my Ebay specialist get usually gets the real pristine stuff for me but I get most of the machines I sell come from customers coming in or people call the shop every day looking to sell me their old typewriter. I buy a lot of machines but only ones I know I can sell, I turn away a lot too. Today I took my family to Newburyport by the ocean for the afternoon and went into a antique shop and bought a Olympia SM-7 & SM-9 for a ridiculous pittance. Made my day. Cameron- I do get lots of enjoyment matching up people to typewriters. My old boss was a salesman for most of his life and said the key to selling was to read your customer within 20 seconds and he drilled that in my head for ten years to the point where you don't think of it but react intuitively. It's the most fun thing I do every day especially selling to teenagers and people in their 20's. It's a joyful experience. 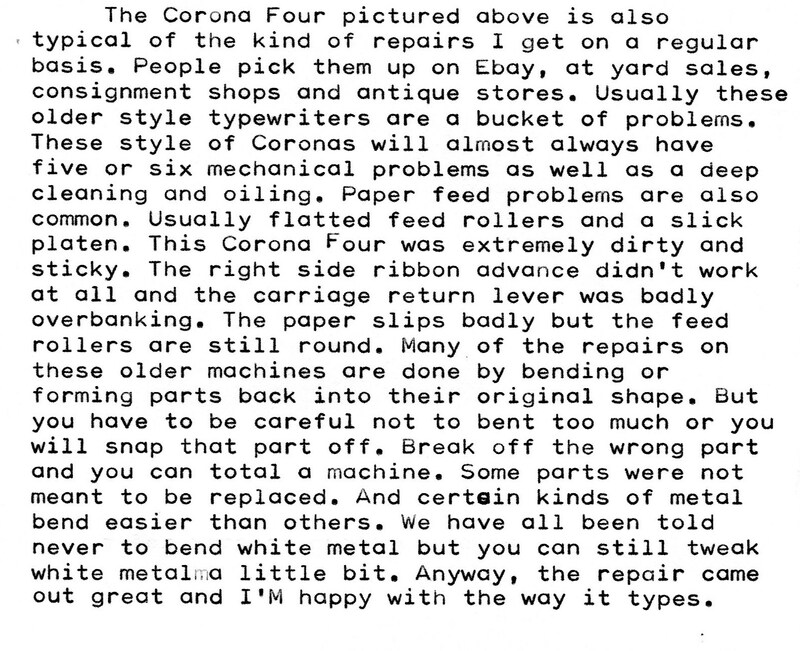 Tom- I read some more after I posted and found where you mention buying a typewriter from a customer. I would think it's a full-time job to keep an adequate supply in stock. I'm sure that some people think their rusty-dusty is worth far more than it actually is and that makes for some interesting conversations. I wish there were more places still around like yours. Clark- You have no idea! Lots of peole think their machines are worth way more than they really are. Especially older ladies who say they checked on Ebay and saw someone selling their typewriter for $500 so it must be worth that much. Many people are very generous and donate their machines to me so I can stay in business and give their typewriter another life. 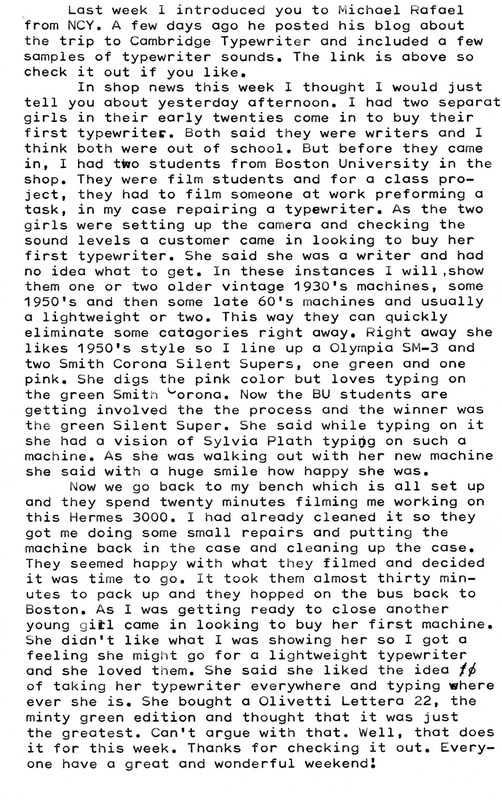 Interesting the girl imagining Sylvia Plath typing on the Silent-Super. Made me wonder whether you had a Lettera 22 in, as that's what Plath used. Then the next girl in buys a Letter 22. Fascinating.